I walk to the store a lot which prevented me from buying pop too much. Who wants to lug it all home? I love not having a bunch of cans and bottles around. I just make it when I want it. It's really easy to do. Watch this video to see. SUPER easy! 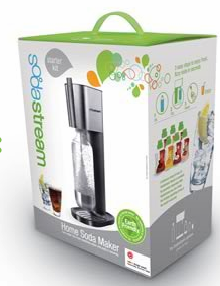 You just use tap water, carbonate it in the fancy gadget, then add the flavor. If you know a pop lover this would be an awesome gift! They have any flavor you can think of! Over 30 different ones. The diet flavors don't contain Aspartame and the regular flavors do not have high fructose corn syrup. Right now you can use code BESTFRIENDS to get $10 off! I can't wait to try some at your place!